Cost of Federal Crop Insurance is an on-going farm policy issue. In his Fiscal Year 2019 budget, President Trump proposed a 14 percentage point reduction in the insurance program subsidy. A farmdoc daily article of March 15, 2018 estimated that the proposed 14 percentage point reduction is associated with a 17 percentage point decline in share of planted acres insured for barley, corn, cotton, oats, peanuts, rice, sorghum, soybeans, and wheat as a group. The estimated decline potentially conflicts with a long standing goal for crop insurance to insure a large share of acres in order to reduce the demand for ad hoc disaster assistance. 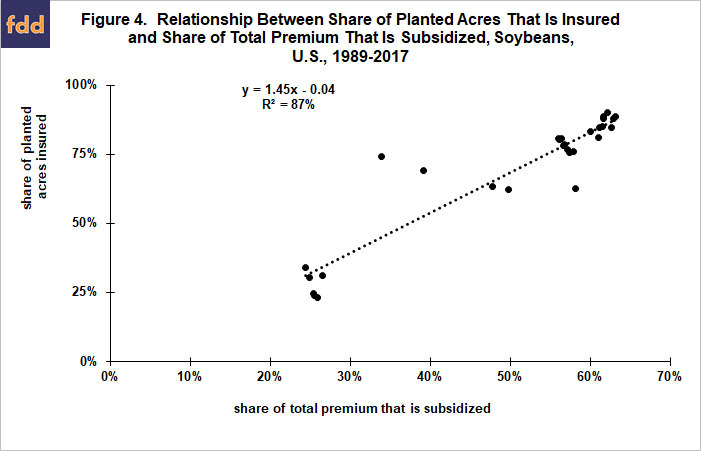 This article continues the analysis by examining whether the relationship between share of acres insured and premium subsidy share varies by crop. Such a variation is found, implying additional policy issues. In 1989, the first year electronic data are available from the Risk Management Agency; the premium subsidy share varied from 22% (peanuts, rice) to 28% (sorghum) (see Figure 1 and data note 1). In 2017, the range was from 60% (peanuts) to 65% (sorghum). 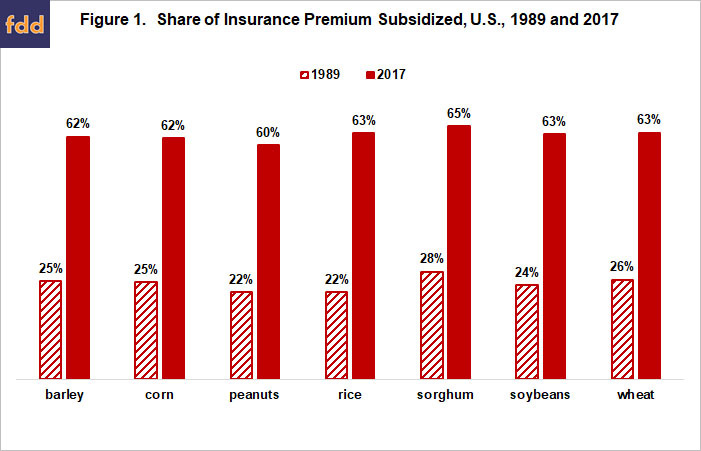 A narrow range was expected because for the crops in this study the subsidy share is the same for a given insurance product and coverage level. The different premium subsidy shares by crop thus arise because producers of a given crop elect different products and coverage levels. 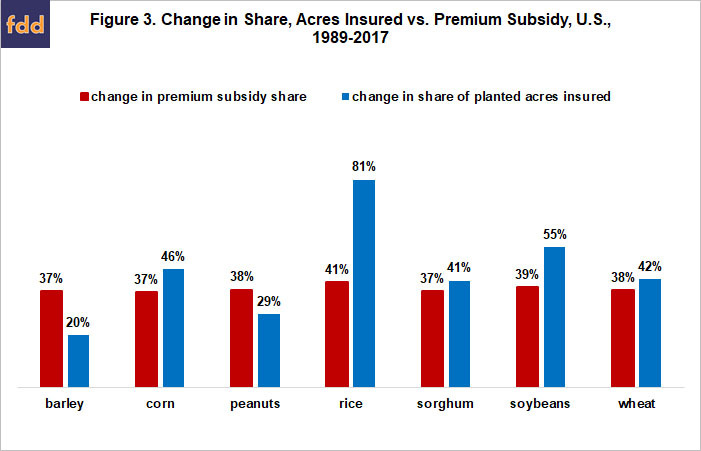 The different changes across crops in insured acre share for relatively similar changes in premium subsidy share suggests the relationship between these 2 variables is likely to vary by crop. Regression analysis confirms this suggestion. 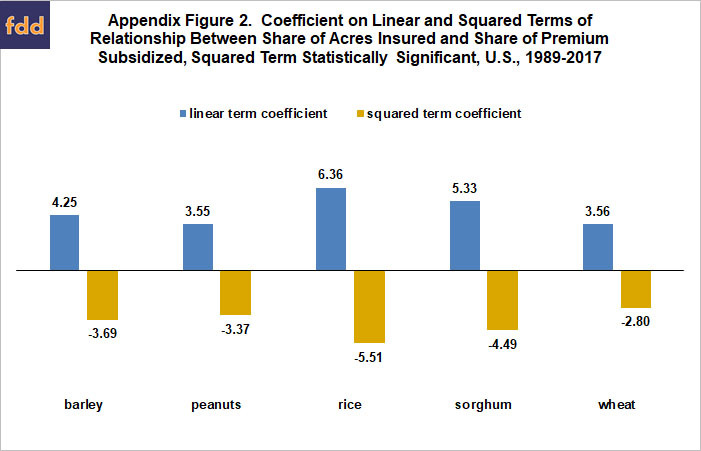 Figures 4 and 5 present the scatter graph of insured acre share vs. premium subsidy share for soybeans and sorghum. 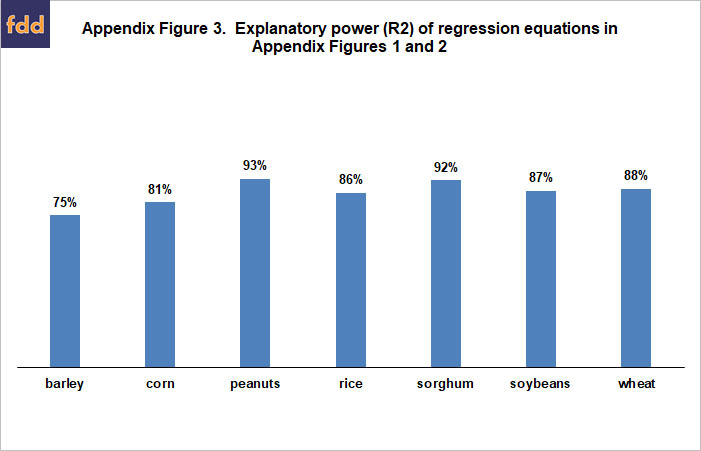 Explanatory power of the regression equation estimated for the 2 crops is the same (R2 = 87%), but the best fit is a linear equation for soybeans vs. a nonlinear equation for sorghum. Like soybeans, the best fit for corn is linear while, like sorghum, the best fit for barley, peanuts, rice, and wheat is nonlinear (see Appendix Figures 1-3). 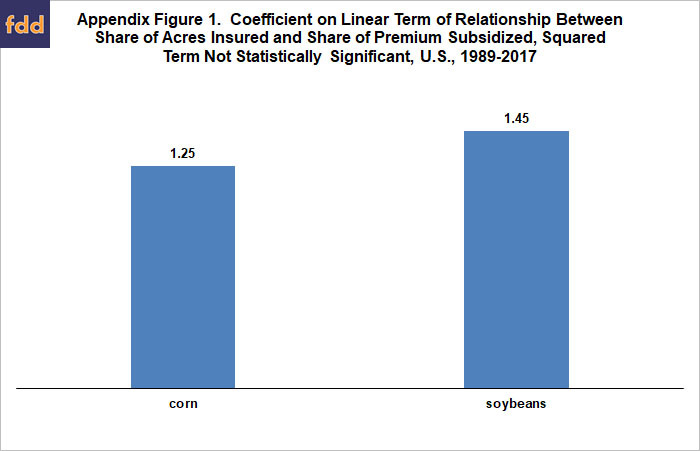 A nonlinear best fit implies that, as the premium subsidy share increased, percentage point increase in insured acre share became smaller. A linear best fit implies no such diminishing response, at least over the 1989-2017 period. 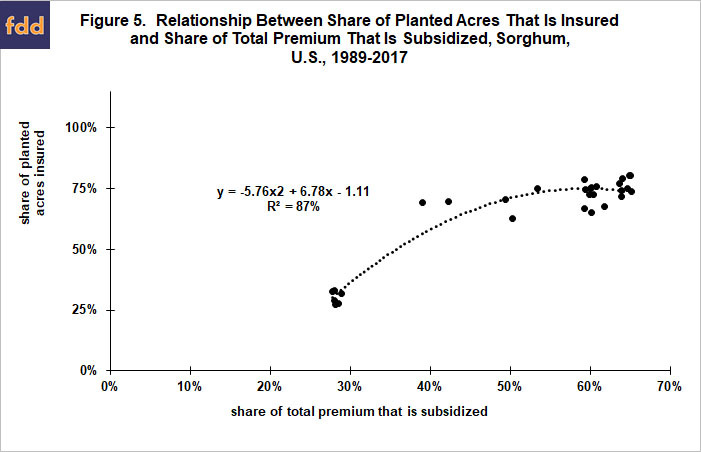 Implication of the 2 different relationships is illustrated by using the regression equations to compare estimated share of acres insured at the subsidy share observed for 2017 vs. estimated share if the subsidy share is reduced 14 percentage points, as President Trump has proposed. 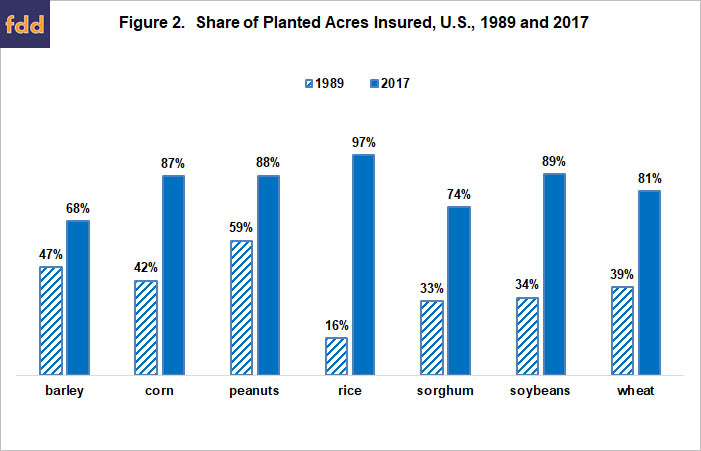 Share of acres insured for corn and soybeans is estimated to decline by 18 (86%-68%) and 20 (87% – 67%) percentage points, respectively (see Figure 6). In contrast, the decline is minimal (2 percentage points or less) for barley, peanuts, rice, and sorghum (see data note 2). The largest decline among crops with a nonlinear best fit is wheat at 5 percentage points (82% – 77%). The different findings for corn and soybean insured acres prompts the “why” question. 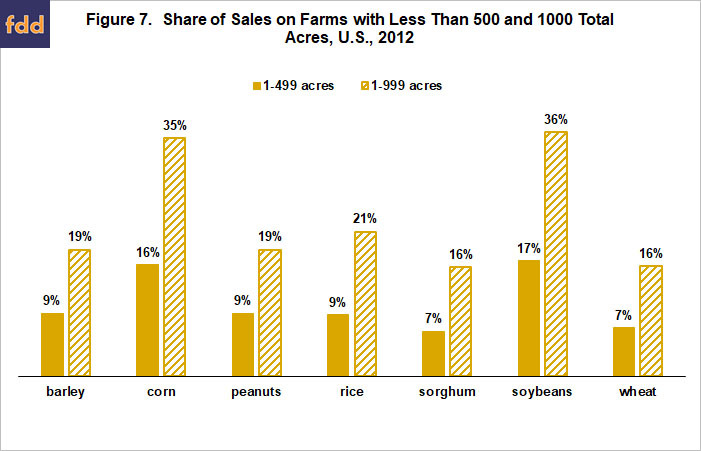 One potential explanation is that a larger share of corn and soybean acres are on smaller farms. Share of corn and soybeans on farms of less than 500 total acres is approximately twice the share of the other crops (see Figure 7). The same is true for farms of less than 1000 total acres. Nonfarm income is a larger source of income on smaller farms. The 2012 Census of Agriculture reports that farm income is 25% or more of household income for 75% for farms with over 1000 total acres vs. only 22% of farms with less than 500 total acres. The diversification provided by nonfarm income reduces the need for crop insurance and thus likely increases the responsiveness of smaller farms to changes in the premium subsidy. 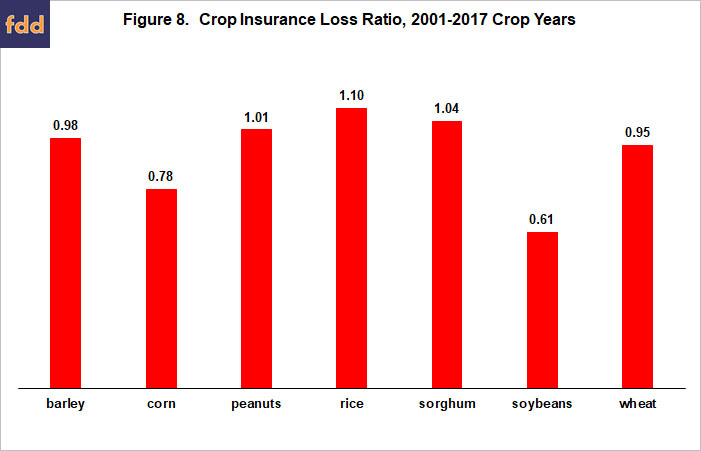 Knight and Coble reported that a positive relationship between farm size and purchase of crop insurance was one of the key findings of the crop insurance research literature between 1980 and the mid-1990s. Cotton is not included in this study because of the potential influence of the STAX county cotton insurance contract authorized by the 2014 farm bill. At 80%, its subsidy share is higher than any other county insurance product. Oats is not included since a large share of acres planted to oats is not harvested but planted as a cover crop. Insurance data used in this article are from the U.S. Department of Agriculture (USDA), Risk Management Agency while planted acre data are from QuickStats (USDA, National Agricultural Statistical Service). 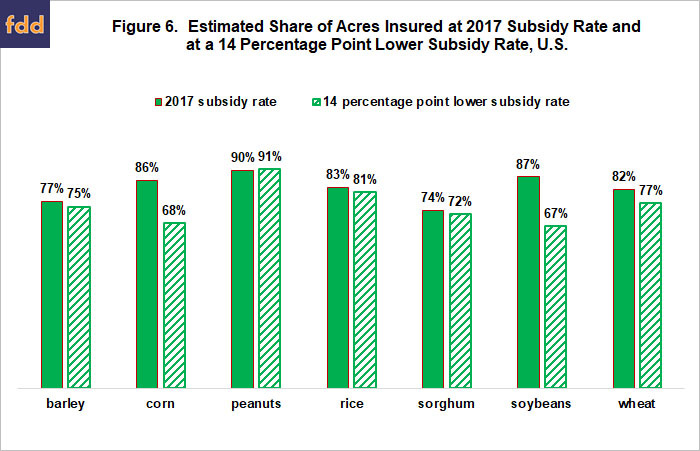 Estimated insured acre share is higher for peanuts for the 14 point reduction than for the 2017 subsidy rate: 91% vs. 90%. A decline is more likely. The estimated increase could be the result of several factors, including data measurement errors and a relatively small number of observations. Closeness of the 2 estimates suggest the decline will likely be small. Knight, T. O. and K. H. Coble. "Survey of U.S. Multiple Peril Crop Insurance Literature since 1980.” Review of Agricultural Economics (19):1: pages 128-156.